The facet joints, also known as zygapophysial joints are synovial joints which help support the weight and control movement between individual vertebrae of the spine. Common symptoms associated with facet joint pain include muscle spasms which can pull the spine out of alignment and cause back pain. Often patients will report just bending over to tie a shoelace for example and suddenly being unable to move. The usual acute attack of back pain involving facet joints occurs suddenly with no warning. The facet joints or zygapophysial joints are synovial joints which help support the weight and control movement between individual vertebrae of the spine. The facet joints work together with the intervertebral discs to enable the spine to move. The facets have an articular cartilage or hard, smooth cartilage on the ends of the done which along with the joint capsule allows movement but also provides stability. Facet joints have a nerve supply from two levels, one branch arises from the nerve root at that level and the second from the level above. When functioning correctly, facet joints move freely controlling the movement of the spine. 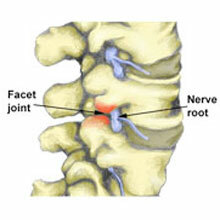 Facet joint pain may arise directly from the facet joint either from inflammation or nerve impingement. This spasm of adjacent muscles is the bodies way of protecting the area and tries to prevent you from moving and incurring more damage. Symptoms can vary greatly and be confused with disc-related disorders as its possible for patients to report referred pain into the lower extremities. The traditional facet locking syndrome may lead to such an acute attack but can be resolved successfully by freeing the offending joint and restoring normal function. Usually, damage at the facet joint can be seen on plain X-rays, which are taken from front to back, side to side and obliquely across the joint. In some cases, a CT scan can be used instead as this will show up more detail of other structures in order to rule them out. If nothing is found, an MRI scan may be taken to reveal any problems with associated structures such as discs and ligaments of the spine. Another method sometimes used is an injection into the facet joint itself, sometimes called a facet joint block. The injection consists of x-ray contrast material, local anaesthetic, and cortisone. If this eases the symptoms then this is considered diagnostic of facet joint dysfunction. There are a number of treatment options available, of which some may work better for some people with another proving more effective for someone else. Rest and get in the position which is most comfortable and try not to stress it further. Some therapists will recommend cold therapy and some prefer hot packs. Whatever seems to offer the most relief is fine. Use this for 15 minutes at a time every couple of hours. Anti-inflammatory medication such as ibuprofen may be helpful. Try not to follow outdated advice to rest flat on your back for a week! It is better to try to get some gentle movement going within a day or so. After the acute stage has passed, treatments such as sports massage may help to ease associated muscle spasm. Chiropractic mobilization may be helpful to free stiff joints and allow better movement but should only be done by a qualified professional. Exercises to improve the posture and strengthen the back and core muscles may be helpful.